Sebastian Aho, LW/RW** (NHL.com rank: 64) -- The 21-year-old is coming off NHL career highs in goals (29) and points (64) last season, leading the Hurricanes in each category. He has room for further improvement in power-play points (16) but led Carolina in power-play goals (eight) and overall shooting percentage (14.5). Aho has formed a high-end fantasy duo with linemate Teuvo Teravainen in all situations and can exceed 70 points if the Hurricanes take the next step this season under new coach Rod Brind'Amour. Target Aho among the top 75 overall. Dougie Hamilton, D (78) -- The 25-year-old finished tied with Ivan Provorov (Philadelphia Flyers) and Victor Hedman (Tampa Bay Lightning) for the NHL lead in goals among defensemen last season (17) with the Calgary Flames. Hamilton had an NHL career high in shots on goal (270), but his PPP (12) total was his lowest in four seasons. 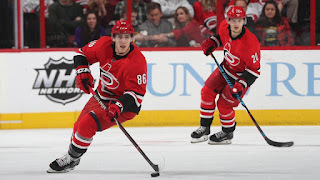 Even if defenseman Justin Faulk, the focus of trade speculation, isn't moved, Hamilton (traded to the Hurricanes on June 23) is in line to take on first power-play responsibilities, making him a top 15 fantasy defenseman. Teuvo Teravainen, C/LW/RW** (90) -- The forward, who turns 24 on Sept. 11, was a streaky fantasy player last season but finished among Yahoo's top 100 overall (95). He improved his point total by 22 (64 last season; 42 in 2016-17) and had NHL career highs in five of the six standard fantasy categories. He has an even higher ceiling on a line with Aho and one of the Hurricanes' talented forward prospects (Andrei Svechnikov or Valentin Zykov). It's worth noting Teravainen had 25 points (12 goals, 13 assists) and was plus-9 in a 26-game stretch from Jan. 25 to March 22, carrying many deep into the fantasy playoffs. Andrei Svechnikov, RW (133) -- The No. 2 pick in the 2018 NHL Draft should make the Hurricanes out of training camp, especially with forward Jeff Skinner getting traded to the Buffalo Sabres on Thursday, and is projected to make an immediate fantasy impact. The 18-year-old had 72 points (40 goals, 32 assists) in 44 games with Barrie of the Ontario Hockey League last season, including a 23-game point streak (46 points; 24 goals, 22 assists) to end the regular season. He would return immense value as a late-round fantasy pick if he beats out Zykov for the top-line spot next to Aho and Teravainen. Petr Mrazek, G* (175) -- After an inconsistent season with the Detroit Red Wings and Flyers, Mrazek has another fresh start in Carolina, where he'll compete with Scott Darling for the starting job. Mrazek was a combined 14-13-6 with a 3.03 goals-against average, a .902 save percentage and four shutouts, including at least three goals allowed in 12 of his 16 games after being traded to the Flyers on Feb. 19. He agreed to a one-year contract with Carolina on July 1 and is capable of being a late-round steal based on his fantasy finish three seasons ago (68th overall in Yahoo). In addition to trading for Hamilton, the Hurricanes signed shutdown defenseman Calvin de Haan to a four-year contract July 3, helping Mrazek's fantasy sleeper candidacy. Valentin Zykov, LW/RW (197) -- The 23-year-old led the American Hockey League in goals (33) and PPG (17) last season, and had seven points in 10 games (three goals, four assists) for the Hurricanes late in the season after he was recalled from Charlotte. Zykov had 10 SOG and was plus-4, skating on the top line with Aho and Teravainen. If that's the case again, he'll be a must-add. Zykov also likely will be overlooked because of the appeal of Svechnikov, possibly making him available in the late rounds.